Rewarded ads and free-to-play games are the peanut butter and jelly of the mobile app industry. While in-app purchases feel a bit forced even in the best mobile games, rewarded just fits: players love the free bonuses, and developers love the revenue, longer session lengths and, surprisingly enough, higher IAP sales. Mobile ads didn’t always work so well. Before rewarded, ads were forced events: for instance, if a player died in a level-based game, an ad would pop up, forcing the user to close it or interact before playing again. A rewarded ad (such as an offer wall or rewarded video), on the other hand, would make interacting with an ad optional in exchange for an extra life—an interesting and beneficial choice for the player. Most rewarded ad integrations started out this way: as upgrades to traditional banner and interstitial ads. But it didn’t take long for developers to come up with more creative integrations, like the booster (sometimes called multiplier or speed-up). Boosters are game mechanics that increase something of value in a core loop, whether that be currency, energy, experience, troop training speed, item drop rate, and more. For instance, in Futureplay’s Build Away (read how Futureplay is changing the ad monetization game), a rewarded video ad booster gives double profits, the game’s soft currency, for a short period of time—a huge reward that players find impossible to refuse. 1. Fixed interval rewards: These are rewards given out after a set amount of time. For instance, in NimbleBit’s Bit City, players can watch a video ad (the desired behavioral outcome) in exchange for doubling in-game time for 10 minutes of real-world playtime (the reinforcement). 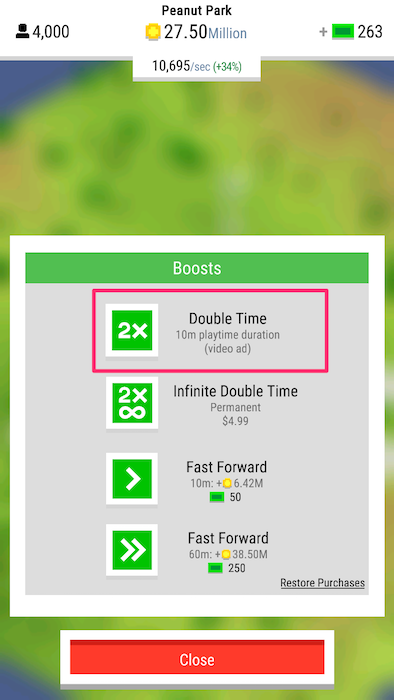 After 10 minutes have passed, the player needs to trigger the Double Time booster again to receive the time booster. Why fixed interval for rewarded ads: Fixed intervals are a fast way to build habits, like logging in to a mobile game for daily login bonuses. Bit City’s Double Time booster is a fixed interval rewarded video ad placement. 2. Variable interval rewards: These are rewards that occur after a varied and unpredictable amount of time. 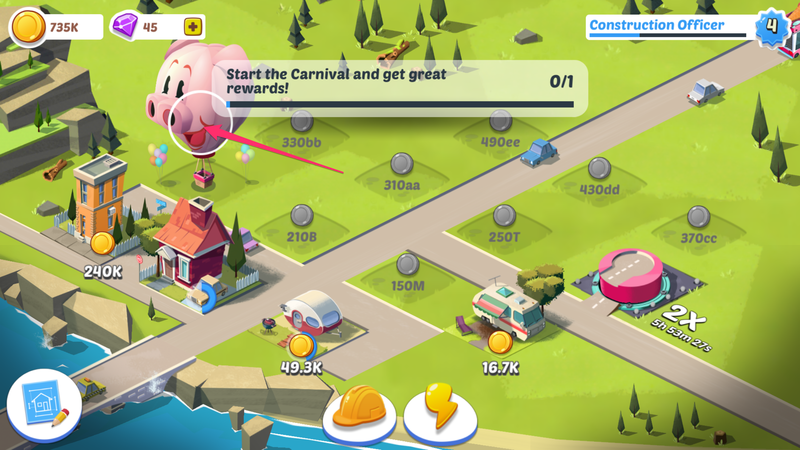 In Futureplay’s Build Away, a pig-shaped hot-air balloon randomly appears that grants a 30-second “frenzy” of rewards (the reinforcement) by watching a video ad (the desired behavioral outcome); this balloon is regularly available but not on demand. Why variable interval for rewarded ads: Variable intervals are a great way to produce a lot of a specific behavior, like logging in on every single coffee and bathroom break to check for the reward, whether or not enough time has passed. Build Away’s hot-air balloon is a variable interval rewarded video ad placement. 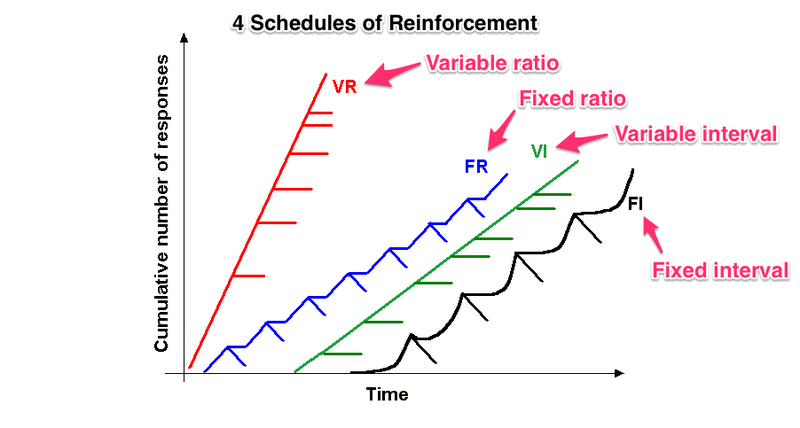 Fixed interval and variable interval are two different types of intermittent reinforcement schedules, which are schedules that reward behavior after certain ratios or intervals of responses. These schedules of reinforcement are tools in operant conditioning. Coined by behavioral psychologist B.F. Skinner, operant conditioning is a type of learning where a desired behavior is more likely to be repeated if the target behavior is encouraged with a reinforcement. But if a behavior is followed by punishment, it is less likely to be repeated. Rewarded video ads integrated during negative moments within a mobile game, for example, could turn away players from interacting with ads again. Many of the mobile games that use these fixed and variable interval behavioral techniques for rewarded ad boosters are in the “incremental” genre, which was invented just a few short years ago. Incremental games have exponentially scaling economies: that’s why their developers can afford to give out double or quadruple earnings. They also have very strong feedback on the value of bonuses: players see numbers going up faster, so they know the rewarded ad was worth it. And, on the flip side, players don’t want to miss out on their every-few-hours chance to get more—triggering a feeling psychologists refer to as loss aversion. But boosters don’t end with scientific discoveries by game researchers and psychologists. The best booster designs tap yet another field: sales. AdVenture Capitalist’s stacking mechanic for its rewarded video ad integration. “Stacking” is an additional mechanic available in several mobile games, including Build Away and Hyper Hippo games like AdVenture Capitalist. The concept of stacking is simple: instead of forcing the player to wait several hours to access their fixed interval reward again, stacking lets them combine multiple rewards at once. 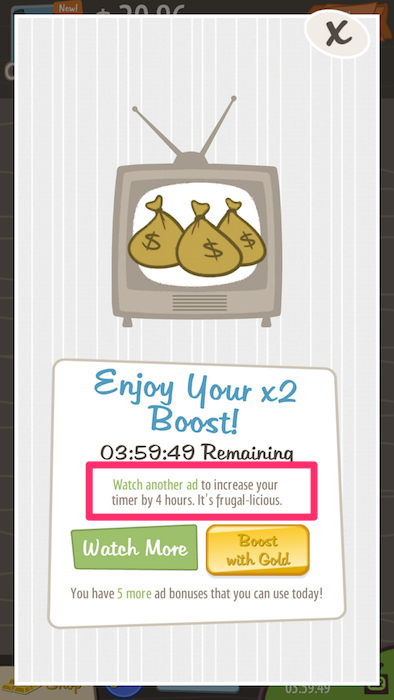 Instead of watching one video ad for 2 hours of reward, the player can watch six ads for 12 hours. Why does this work, rather than ruining the game design? In part, because incremental games are addictive even without a requirement to come back (and of course, the variable interval reward is still waiting). 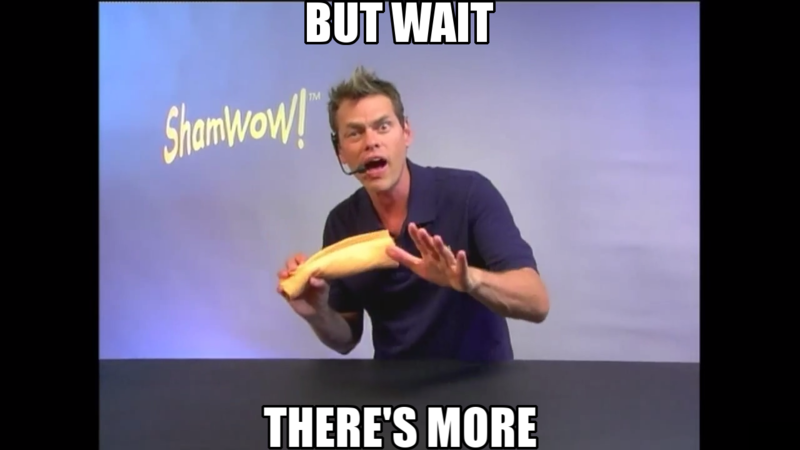 But stacking also relies on sales persuasion that shows off a compelling deal, then offers to make it much better, with hardly any additional investment from the “buyer.” It’s sometimes called the “but wait, there’s more!” technique—as popularized by the Shamwow guy Vince Offer, Billy Mays, and Ron Popeil—except instead of additional kitchen rags, players are getting longer periods of boost. Stacking sustains momentum, even while the player is away or asleep, and works very well with one of mobile gaming’s prime commandments: keep the player coming back at least once every day. Boosters usually work best in resource management games, where gradually increasing costs create ever-longer intervals between achievements. Good boost design allows players to see how long it would take to complete the first few achievements—and then shortcuts the process. And since multipliers are useful at any point in the game, older players continue using boosts for long-term goals like unlocking expensive buildings or land expansion. 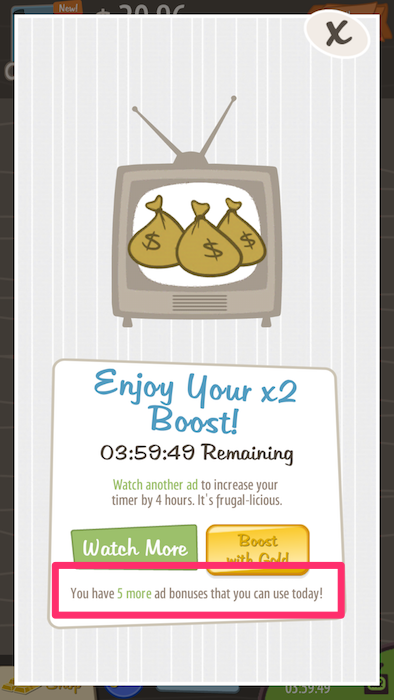 AdVenture Capitalist’s rewarded video ad integration let’s users know how many boosts they have left each day. But boosts shouldn’t just be copied from another game. Instead, developers should think about their own goals. A two-hour fixed interval reward, for instance, could bring back players eight times a day, which is more than some games want or need. Stacking, on the other hand, shouldn’t be infinite, since you want players returning at least once a day. Finally, keep in mind that rewarded ads rarely cannibalize in-app purchases—even when they look directly competitive. Players who wish to pay will still do so if there’s anything worth purchasing, even if they got another great bonus for free. In incrementals, for instance, it’s typical for a multiplier to come from rewarded ads, while a very similar one can be purchased with IAP. Since only 1.9 percent of players spend in mobile games in the first place, while well over 50 percent will interact with a good rewarded ad placement, it’s no surprise that the two monetization mechanics aren’t competitive. For more on the best ways to use rewarded ads, keep an eye out for upcoming stories diving deep into winning rewarded video ad integrations!